The Canon 5D Mark II features a huge, full-frame sensor. A 21.1-megapixel CMOS sensor delivers images of up to 5616 x 3744 pixels. And since it is full-frame, all lenses will deliver the angle of view they would on a 35mm camera without a conversion factor. This comes in handy especially when shooting with wide-angle lenses. For the flexibility to shoot in even the most dimly lit situations, the EOS 5D Mark II offers Canon’s highest ISO sensitivity to date, ranging from 100-6400 (expandable to ISO L: 50, H1: 12800 and H2: 25600). Thanks to improved noise reduction technologies, images shot even at highest sensitivity will be remarkably smooth. 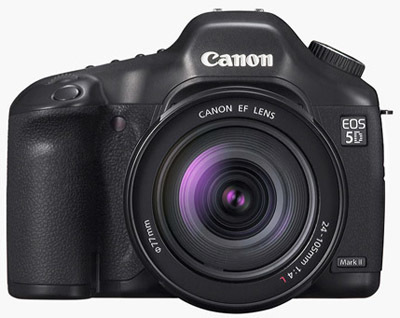 The Canon 5D Mark II is the first digital EOS to offer recording of Full HD video in Live View Mode. Capable of shooting clips almost half an hour long at full 1080 resolution, the EOS 5D Mark II makes it possible to shoot broadcast quality video on your camera by simply changing settings. The advantages move way beyond the ability to shoot on your SLR – the wealth of high-speed lenses and shooting accessories that make EOS photography so remarkable can be used in shooting video. Where interchangeable lens video cameras cost thousands of dollars, with the EOS 5D Mark II their operation, including HDMI output, is simply an added bonus to a remarkable camera. The EOS 5D Mark II now has manual exposure control while shooting video. When you are in Manual Mode during video recording, you can control the aperture, sensitivity from ISO 100-6400 (expandable to 12800), and shutter speed from 1/30 – 1/4,000 second. This new feature transforms the EOS 5D Mark II into the first full frame 24mm x 36mm DSLR with manual exposure video control, creating an amazing tool for the video and motion picture industries alike. The EOS 5D Mark II is compatible with all Canon lenses in the EF lineup, ranging from ultra-wide angle to super telephoto lenses. Canon lenses employ advanced optical expertise and micron-precision engineering to deliver unprecedented performance in all facets of the photographic process. Special optical technologies, such as Aspherical, ultra-low dispersion, or fluorite elements are featured in the universally acclaimed L-series lenses. And Canon’s Optical Image Stabilizer technology is featured in select lenses to minimize the effect of camera shake. Through Canon lenses, photographers can truly maximize the quality and liberating performance of the EOS 5D Mark II.